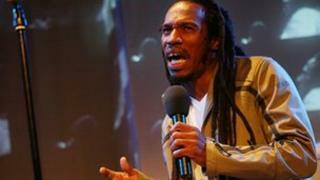 Performance poet Benjamin Zephaniah says black and Asian pupils are turned off history because they are told only "half the story" in British schools. But all over Britain, he says, many regularly attend Saturday schools to learn about their own community's history. The poet, who works in schools, also says multiculturalism is under attack. History Curriculum Association chief Chris McGovern said black pupils wanted to study traditional British history. He said black pupils and their parents he had met in Lewisham "were fed up with a diet of slavery and deprivation" and preferred some of "the more traditional diet of schools like Eton". Zephaniah was speaking ahead of a talk in memory of Anthony Walker, who was killed in a racist attack in 2005. The comments are particularly pertinent as Education Secretary Michael Gove has said schools should focus on a traditional narrative of British history in response to concerns it had become too politically correct. He has said that the current approach to history denies "children the opportunity to hear our island story", and that this has to change. And reports last weekend suggested schoolchildren would have to learn about 200 key figures and events in British history from the Anglo-Saxon kings to Winston Churchill. But Zephaniah told the BBC: "The reality is for young black kids in school, the majority of them know that when it comes to history, especially the history that includes the Caribbean and Asia, we have only got half the story. "That's why all over Britain in our communities we have classes in people's front rooms and community centres teaching us the real black history. "We get kids that are playing truant in the week, still going to classes on a Saturday to learn the real history. "Most of the history teachers that I come across cannot name any early African philosopher." He added that there was far greater focus on the the work of Florence Nightingale in schools during the Crimean War when the Jamaican nurse Mary Seacole made just as big a contribution. He continued: "The truth is if you have the real history of the world, the British involvement in the empire would not look so rosy. "For example the massacre of Amritsar is not spoken about." This was the incident under the British Raj when 379 people were killed and 1,200 wounded when native troops under British command opened fire on a crowd in the northern Indian city. He added: "Black history is not just for black people - it's important for all of us who want a real history of the world." Secretary of the Campaign for Real Education Nick Seaton added: "All youngsters live together in the same country and they need to know about the history of the society that they're living in." He added that all countries focused on teaching their own history and that it was ridiculous to suggest a large proportion of the time should be given over to African or Asian history. Zephaniah also expressed concerns that multiculturalism was under attack, saying that "to be against multiculturalism is anti-British". He said: "When politicians say, as [David] Cameron has said, 'What we want is not multiculturalism, but muscular liberalism' - what does he mean?" He complained that the Britishness test for those wishing to become British citizens was laughable. "Some of the questions are like how many Catholics live in St Albans. I see people who are really stressed about it. But it doesn't make you British passing that test," he said. The comments come ahead of a lecture commemorating the life of Anthony Walker. The poet, who runs poetry workshops in schools, gave the lecture in Birmingham on Friday evening. The NUT, which sponsors the event, used it to launch a set of new educational materials tackling racist and religious hate crime for schools. They also highlight the persecution of black people during the Nazi regime. NUT general secretary Christine Blower said: "Racism in schools or our communities needs to be eradicated. As multiculturalism is being attacked on a daily basis, we need to celebrate the diversity of modern Britain and work together to raise children who are proud of themselves and their communities."